If you are a private landowner with a lake or pond on your property, you most likely have an interest in maintaining your water body so that it serves your wants and needs. A water body can be used for many purposes, which may include fishing, swimming, boating, or wildlife habitat. Though there are many things that can be done to help a lake or pond reach a condition suitable for a particular use, there are general steps that can be taken which apply in nearly all cases. 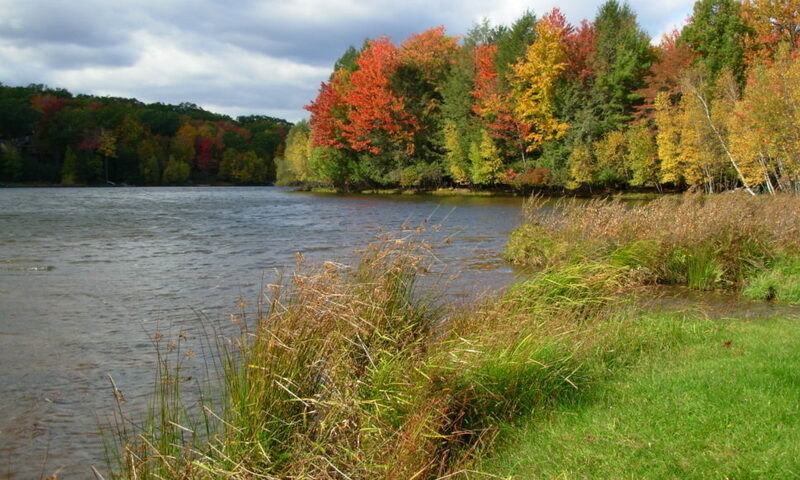 Keeping your lake or pond healthy and in ecological balance begins with protection. Trees and shrubs around the perimeter of a water body act as a barrier between the water and outside sources of pollution. They also stabilize banks, prevent erosion, and take up excess nutrients from the surrounding area. In addition, the plants provide habitat and food for birds and many other animals. If there is not a buffer of vegetation around your water body, planting one can yield great benefits. When excessive nutrients enter a water body it can lead to a number of problems. Nutrients such as nitrogen and phosphorus can come from a variety of sources such as over-fertilized lawns, leaky or poorly maintained septic systems, agricultural operations, exposed soil, or other sources. To the greatest extent possible, it is vital to control the nutrient input from these sources to maintain good quality water in a lake or pond. When they enter a water body, they are taken up by algae and plants. If the nutrient load is very large, algae can grow and reproduce so much that it can cause the water to become devoid of oxygen, making life for fish and invertebrates impossible. A water body blanketed by green algae is also aesthetically unattractive, and usually not desirable for recreational activities. Impervious surfaces such as parking lots and the roofs of buildings prevent water from infiltrating into the ground. Stormwater which would otherwise soak into the ground travels over land into creeks, rivers, and lakes. This stormwater may wash loose sediment, fertilizers, pesticides, petroleum products, and anything else in its path into water bodies. If the water is allowed to infiltrate through soil, the water can at least be filtered to a degree as it flows down into the earth and recharges aquifers. Minimizing the amount of impervious surface area around your lake or pond can be beneficial in that it can decrease the amount of stormwater flowing into it.